A hyperlocal website in Essex has teamed up with regional newspaper publisher Archant to launch a print edition. EverythingEppingForest.co.uk, which was founded in 2008 by local journalist David Jackman, will bring out the glossy monthly magazine from next month. Printed by Archant, it will be delivered to 10,000 homes in the area and will include local community news and information, events and advertising. 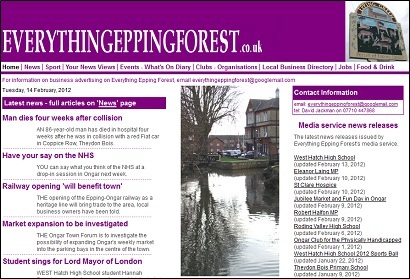 In a statement published on the Everything Epping Forest website (not directly linkable – scroll down), Archant London commercial director Tony Little said: “We are delighted to have set up this partnership with David who is a much-respected local journalist, with important contacts in the local area. This entry was posted in Journalism, Local media, Magazines, Online Journalism and tagged Archant, Hyperlocal, launch, magazine on February 14, 2012 by Paul McNally. English-language, state-owned Chinese newspaper the China Daily is launching a UK and European edition, according to Media Week. The report suggests that the new China Daily European Weekly title will be launched tomorrow with a print run of 25,000 in the UK. This entry was posted in Editors' pick, Newspapers and tagged China, China Daily, launch, Newspapers on December 2, 2010 by Laura Oliver. Shaun Milne sees the soon-to-be launched HeraldScotland site – a merger of the Herald and Sunday Herald websites – as a new opportunity: for design, for the papers to boost their audiences and for journalism graduates. This entry was posted in Editors' pick, Newspapers and tagged Herald, heraldscotland, launch, Scotland, Shaun Milne, Sunday Herald, The Herald on April 28, 2009 by Laura Oliver. The Hong Kong Economic Journal and Hong Kong Economic Times have both launched new websites with paid-for access models. Subscribers to the Times’ site, who will pay HKD598 (£49) a year, will have access to full pages of the newspaper, a three-year archive and real-time markets coverage. This entry was posted in Editors' pick, Online Journalism and tagged Business, China, GBP, Hong Kong, Hong Kong Economic Journal, Hong Kong Economic Times, International, launch, Online Journalism China, real-time markets coverage, South China Morning Post, The Hong Kong Economic Journal, The Times on October 28, 2008 by Laura Oliver. As of today the Liverpool Echo hits newsstands showcasing a new style. The Trinity Mirror regional title has undergone a major face-lift after consultations with its readership. The new look publication will feature brand new education and health sections, a section for women and comprehensive local football content. It will also sport a new design featuring a new masthead and cleaner layout. Following last week’s launch of The Birmingham Post’s ‘Post Mobile’ service, this week sees Trinity Mirror’s Newcastle Journal and Evening Chronicle follow suit with their own news services for mobile. Plans are still on course for Trinity to have 13 of publications active on mobile by the end of the year. This entry was posted in Mobile, Newspapers and tagged Ali Machray, Alistair Machray, editor, Evening Chronicle, launch, Liverpool, Liverpool Echo, Local, newcastle journal, news services, the Birmingham Post, the Liverpool Echo, Trinity Mirror on October 27, 2008 by Stuart Goodwin. 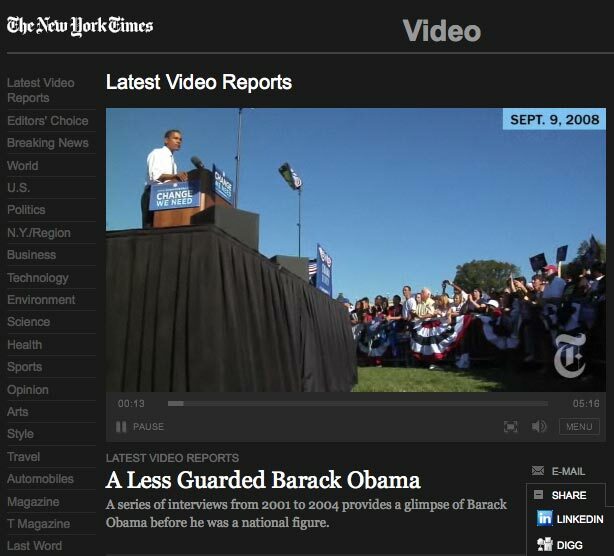 NYTimes.com has developed a new video player to allow clips to be embedded in more sections of the site. The player, which uses technology from Brightcove, will make video available on the homepage, individual article pages and on the site’s blogs, a release from the title said. The player also lets users send footage to social networks and bookmarking sites, including Digg, Facebook and LinkedIn. As part of a video overhaul, the Times’ video library has been redesigned and a regularly updated list of ‘most viewed’ clips now features on the site. “Demand for high-quality video is on the rise across the web from both our users and our advertisers,” said Nicholas Ascheim, vice president of product management for NYTimes.com, in the release. According to the release, the Times produces 100 videos a month, while also featuring content from Reuters, CNBC, MSNBC and Bloggingheads.tv. This entry was posted in Newspapers and tagged Bloggingheads.tv, Brightcove, Facebook, launch, LinkedIn, msnbc, New York Times, Nicholas Ascheim, NYTimes.com, player, product management, reuters, The Times, USA, vice president of product management, Video, video player on October 24, 2008 by Laura Oliver. A press release courtesy of magazine publisher Future tells of the relaunch of TotalFilm.com – complete with a new editorial team for online. Andy Lowe, acting digital editor, and George Walter, who has temporarily moved from GamesRadar.com to work as launch editor, will head up the online staff. Contributions to the site will also come from the print magazine team. The new look site promises ‘hubs’ of content for individual films, in particular new releases, aggregating user comments and related external links. Video on the site has also been ramped up, with more use of clips for Q&As with actors and directors. In the print sphere: Politick!, a £3.99 quarterly ‘aimed at young people 18-35’ (good news for anyone over 30 – that’s officially young then), is preparing for its debut. The title, which claims no political bias in a press release, hopes to better engage young people with politics and the political process. “This isn’t about us telling them we like the Arctic Monkeys. And this isn’t about Cameron, Brown or Clegg. We’re not going to tell anyone who to vote for or what to think. We just want to help young people to realise that they can change the world,” says editor Laura-Jane Foley. Finally – ecoforyou, the green living, digital magazine announced by PlanetInk earlier this month, has launched. The first issue is free from the magazine’s site and boasts video, 34 full-colour pages and Flash animation. A text-only format, which is compatible with screen readers, is also available. This entry was posted in Magazines and tagged acting digital editor, Andy Lowe, animation, ecoforyou, editor, Future, GBP, George Walter, launch, launch editor, Laura-Jane Foley, Magazine publisher, online staff, Politick! on October 22, 2008 by Laura Oliver. McGuire, who has headed up Newsweek’s London bureau for the past 12 years, has set up International Quarterly – a magazine, which will feature 6,000-word articles focusing on in-depth, international news coverage. This entry was posted in Editors' pick, Journalism and tagged in-depth news magazine, Independent.co.uk, launch, London bureau, McGuire, Newsweek on October 20, 2008 by Laura Oliver. US TV broadcaster NBC is to roll out a series of nine local news sites this month. The sites will be ‘less an extension of our TV stations and more of an online destination for the latest local news, information and entertainment,’ says the broadcaster’s president. This entry was posted in Broadcasting, Editors' pick and tagged launch, Local, NBC, online destination, President, United States on October 14, 2008 by Laura Oliver. The planned launch of a new ethical environmental online magazine was announced today. Ecoforyou.co.uk will be free to readers offering environmental news, features, interviews and lifestyle tips. The interactive site will include live-links, video, audio and a ‘digital page turn format’, powered by YUDU and hosted by Planet Ink Ltd. Without a print edition, ecoforyou is aiming to be a ‘100% carbon neutral publication’. The platform, YUDU, advertises itself as a carbon neutral company, off-setting its emissions by donating money to a carbon management company. The site is relying on marketing through social networks with readers encouraged to use ‘forward to a friend’ buttons. “We hope that ecoforyou will not only appeal to individual readers but businesses campaigners and industry leaders too,” said founding director, Gerry Cassidy, in a press release. Ecoforyou will is not the only digital offering promoting green issues, the BBC already has a well established site, bbc.green.com. http://www.bbcgreen.com – lifestyle green living. http://www.ecorazzi.com/ – offers a mixture of celebrity gossip and environmental issues. http://www.ecogeek.org/ – publishes stories daily about innovations that are saving the planet. Any other favourite green news sites? This entry was posted in Online Journalism and tagged BBC, bbc.green.com, Ecoforyou.co.uk, environment, ethical environmental online magazine, founding director, Gerry Cassidy, launch, Planet Ink Ltd, social networks, well established site on October 9, 2008 by Fred Friedrich.